Now that The Third Pig is on shelves, I, of course, want people to flock to bookshops in their thousands and buy it. As part of that grandiose aspiration, Harry needs as much publicity as he can stand (and that's quite a bit). With that in mind, we came up with a cunning plan to try and get review copies noticed. Aha, we said, that does look quite nice, now how else do we get our book noticed amongst the hundreds (if not thousands) of others that arrive on a weekly basis? 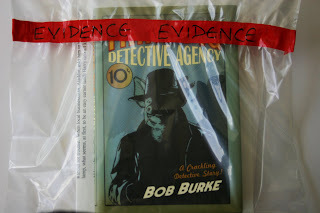 In keeping with the crime theme of the book, we mocked up an evidence bag (see, watching CSI every week can be educational) complete with red tape and included the book and press release in it (excuse quality of photo). It may work, it may not; but if it gets Harry noticed only once by the right people it will have served its purpose. Ha! These are really inventive ideas, especially the evidence bag!